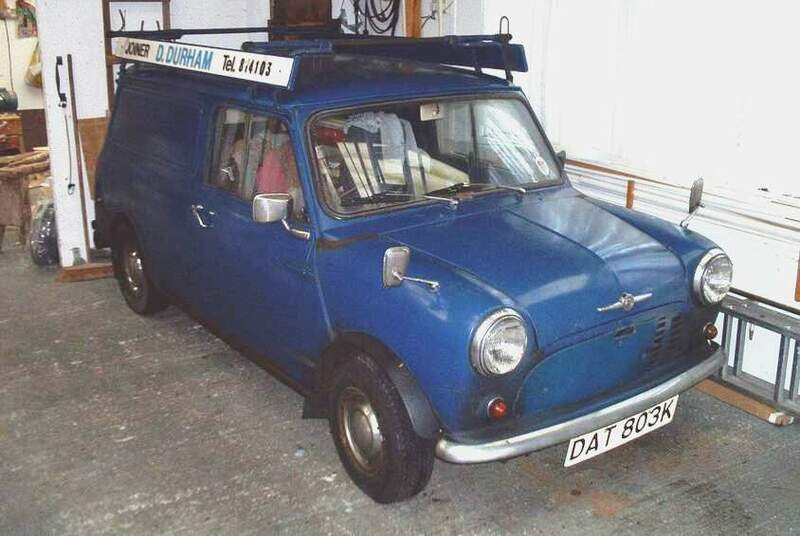 Shortly after I had finished building my first Mini, my lifelong Pal David Durham, got an old mini van himself, to use for his newly fledged joinery business. This was also rusty and he too liked the idea of a new shell to bypass that problem, so in 1972 he bought a new van shell (£178 by now) and we set to, transferring all of the parts into it, but only after he had rust proofed and hand painted it on a kind of home made wooden ‘spit roaster’. This is still his ‘Firms vehicle’ with close on 300,000 miles to its credit on 3 engines built by me. It has certainly earned its keep, frequently pulling a heavy trailer and is still on its original wings, sills and floors! Fig.5 The Firms Vehicle The 'Grot' around the seams, indicators and headlamps is not rust, it's grease - the MOT man loves him!